Paloma our motorhomes first stop of the day and we’re parked up on a fairly rough dusty piece of ground in what seems like the middle of nowhere. In front of us a bridge. It is not just any old bridge though. The tourists are looking over and down and there is a constant clicking of cameras. So where in the world is Team ‘our leap of faith’ ? We are a few hundred yards from one of the most famous canals in the world. It ranks in the same sentence as the Panama, The Grand and the Suez Canal…. 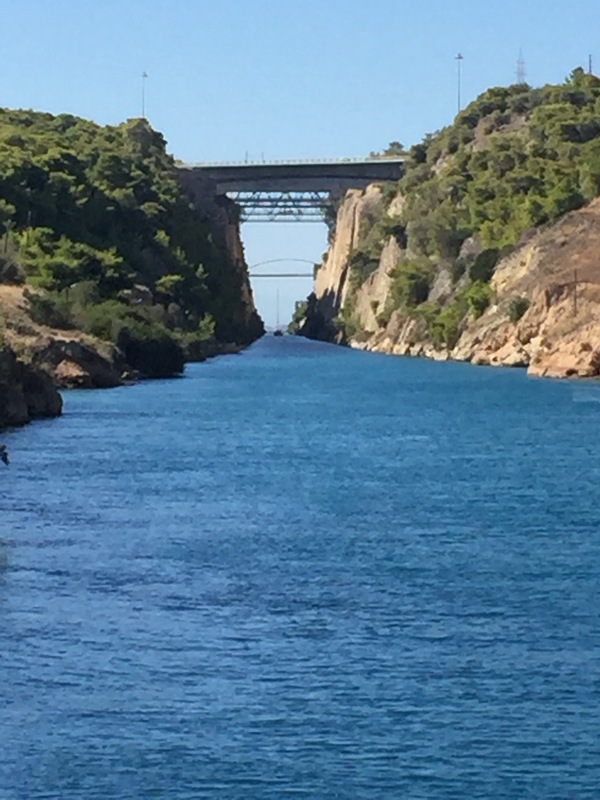 Transecting the Corinth Canal must be the stuff of dreams. From a distance, this small crack in the coastline is unnoticeable, however as you are drawn nearer, the impossible seems about to happen. As your eye is drawn down the stretch of 4-mile traverse, the inevitable “will they won’t they” manage to squeeze through the gap, the thrill becomes unavoidable. The canal is very narrow, only 22 metres wide, it’s another reason to be astonished. This doesn’t allow the passage of the great super tankers but you are hypnotised at the slow passage of boats before your very eyes…. The Corinth Canal connects the Adriatic Sea with the Aegean Sea, effectively cutting off the Peloponnese peninsula at the bottom of Greece and turning it into an island. Although construction was finished quite recently in 1893 by French engineers, the idea for a shortcut to save boats sailing all-round the Peloponnese was long considered by the Ancient Greeks and the isthmus was first crossed by boats in 600 BC when Periander, tyrant of Corinth, built a ship railway for small boats being carried on wheeled cradles running in grooves, pulled by their crew. Demetrius Poliorcetes, Julius Ceasar and Caligulas were subsequent planners, but the lack of tools and technology thwarted their efforts. 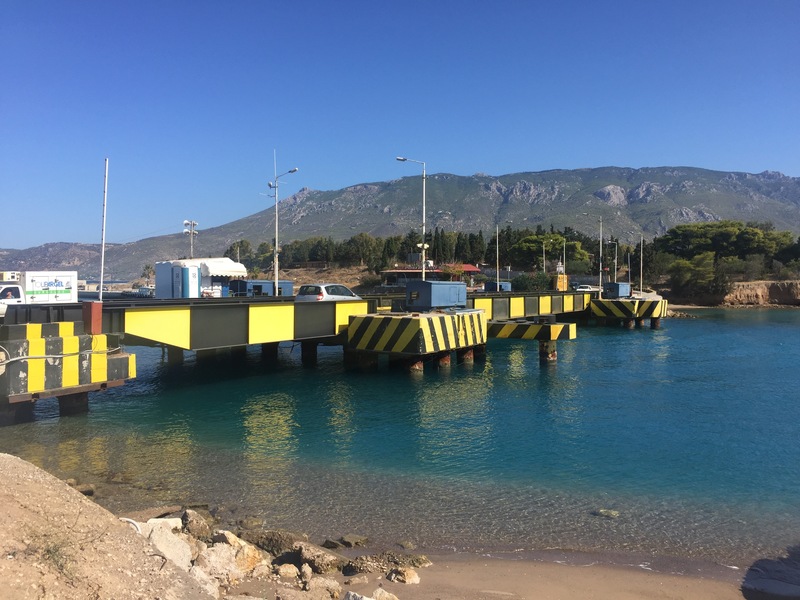 While other bridges over waterways tend to lift or draw back to allow boat traffic to pass through, two bridges at either end of the Corinth Canal in Greece employ a much more unusual strategy. 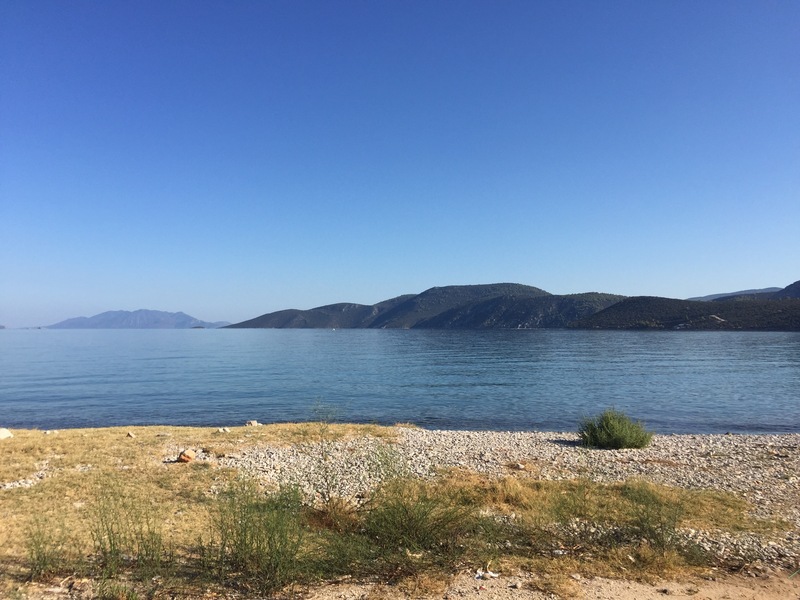 After an amazing time watching the bridges and boats, we headed off looking for a spot to rest for the night, checking out our database of stopovers we spotted a small place called Korfos , with the promise of beachside camping we headed off (N37.756939 E23.11772) ……. 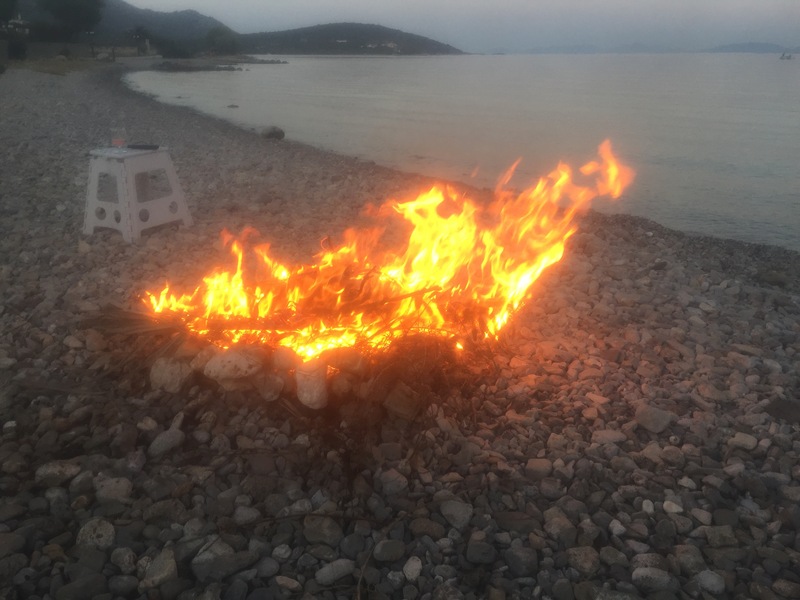 – turns out it’s the first time she’s ever had jacket spuds cooked in a fire ? 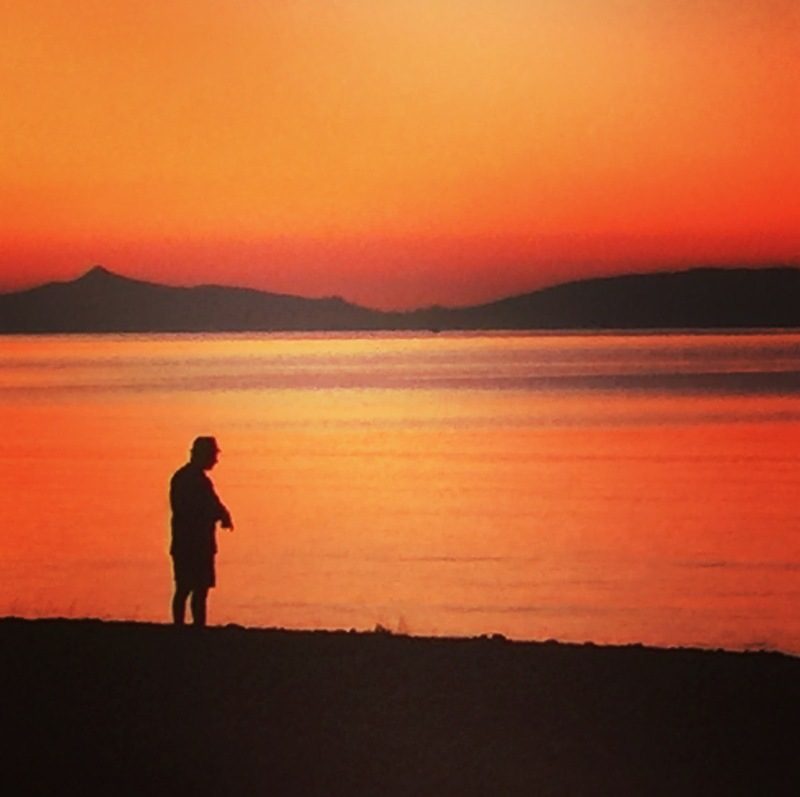 ……..
Plus one of those instragram sunrises – heaven. Ohh we’re off to the hydro museum next where they made gunpowder!! !